Stunning Rustic design makes the perfect statement in this new home design. Stone and brick siding are complimented by beautiful timber trusses and a shake siding gable. The open Foyer leads straight into the Great Room and Kitchen were you'll find 10' ceilings, a split kitchen island with seating and a connected Dining Room. Through the Kitchen you'll find a hallway leading to the Laundry Room, 1/2 Bath, Study and Garage. 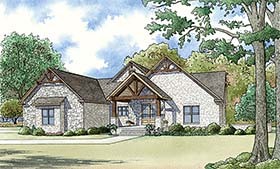 On the opposite side of the home is the Master Suite complete with a luxurious Master Bath and walk-in closet. Down stairs is a walkout basement. Here you have a separate Living Area with a Kitchenette, Bedroom 1 with a Hall Bath, Bedrooms 2 and 3 with a Jack and Jill Style Bath , and a Safe room. Also notice a storage room where your HVAC unit and Water Heater can be located. Don't forget about the outdoor living! Covered Porches are located on both the top and bottom floors.